County Map of Dakota and Nebraska. 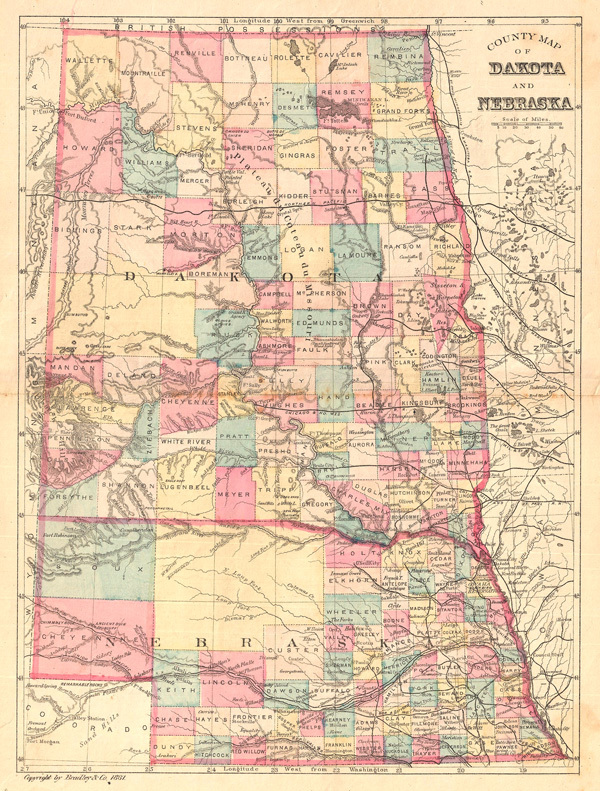 This is an attractive county map of what later become North and South Dakota, and Nebraska, showing counties in light pastels, roads, rivers, and relief shown by fine hachures. Predates the separation of Dakota into northern and southern territories. Western Nebraska exhibits a primitive county structure. By William M. Bradley, from his Bradley's Alas of the World for Commercial and Library Reference, 1881. Bradley, W., Bradley's Alas of the World for Commercial and Library Reference, 1881. Very good, light foxing and overall toning. Original centerfold, as issued.